Nestled in between Leicester Square and Covent Garden, Coffee Island is a global experience. Founded in Greece, the shop handpicks the finest quality beans from all around the world to ply discerning coffee-lovers with a broad variety of filter coffee blends, flavoured coffees, single-origin specialty coffee, teas and handpicked herbs, espressos and so much more. Whether your tastes lie in South America, Africa or elsewhere, the salient point is that the choice is yours. Skilled and coffee-obsessed staff can help you at the in-store grindery as you whip up your perfect blend. The Microfarm Project presents five different single origin coffees: El Salvador Vista Hermosa, Ethiopia Sidama Ardi, Ethiopia Yirgacheffe Kochere, Brazil Ametista, and Colombia Huila. Each of them offers a distinctive taste, aroma and mouthfeel, making your coffee experience one of a kind. For a more exclusive choice, Coffee Island also presents a Guest MicroFarm every three weeks. A new Specialty variety (according to the Specialty Coffee Association of America's evaluation) is selected from around the world, based not only on farms that cultivate their coffee, but the culture of coffee too. Customers can try these guest coffees with different brewing methods, producing different cup profiles. This means that successive visits to Coffee Island become a journey for the senses. The Microfarm Project has one major objective: to make speciality coffee available to all. To make what is premium common! The customer gets to drink superb coffees and the farmers and farming communities' work and living conditions are improved by the partnership through Direct Trade. Direct Trade means that Coffee Island are supporting farmers in the protection and improvement of the soil, water, and of each local microclimate and consistent coffee purchases at fair trade rates, increases the income of farmers and improves the quality of the coffee yield coffee. Beyond the bean, staff are trained in state of the art facilities to gain the full appreciation of all things coffee. The artisan roasting team work hand-in-hand with the R&D team in sections such as grading samples of green beans, sample roasting and a cupping room. The delicious beverages served at the espresso and brew bar are the cumulative result of specialty coffee knowledge and brewing methods. 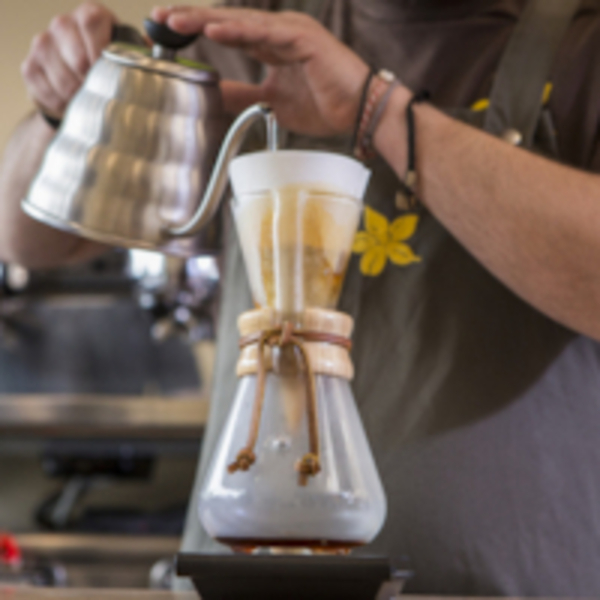 A great variety of coffees are brewed with sophisticated brewing methods, such as, pour over, Chemex, AeroPress, Syphon and unique signature cold coffee drinks. They all have one thing in common, the offer of different cup profiles that can be enjoyed in the coffee shop or taken away to warm up in these winter months.